Of course, I had seen photos of the otherworldly landscapes, but I would have only the shortest time in which to explore them; my stay was mainly within the confines of Reykjavik. And that turned out to be absolutely beyond fine. In fact, for a nerd and bookworm like myself, it was blissful. Any time I had a chance, I would explore the myriad bookstores and libraries in Reykjavik, in addition to other aspects of its very rich book culture. 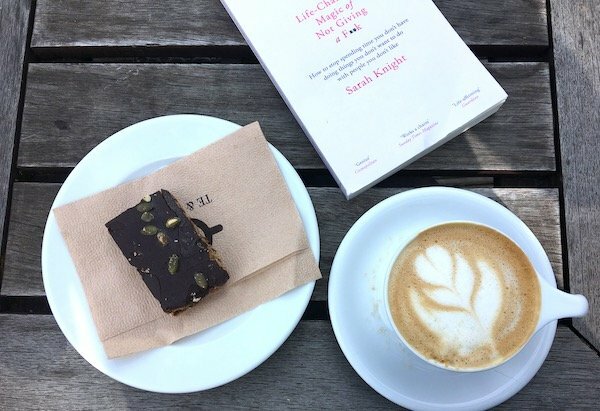 I’m hardly what you call the rugged outdoorsy type; I’m more of a books-and-art-and-coffee type. Iceland offers incredible pleasures for both of these kinds of travelers. If you happen to be a combination of the two, don’t even think about spending less than two weeks there. It’s a small country, to be sure, but it is so dense with culture, history, and natural beauty that a short hop of a few days would be (at least for me) frustrating. Even after having spent a month there, I feel like I just scratched the surface, and am ever plotting a return. Reykjavik is a UNESCO City of Literature, designated in 2011. There are some 28 as of this writing. 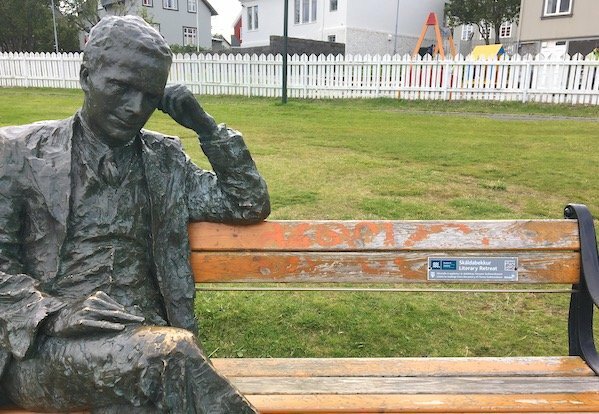 Reykjavik honors its literary figures with street signs, park benches, and more, that can be explored all around the town. Even though I didn’t get to every book-related site during my month in Reykjavik, I did get to plenty of them. This promises to be a lengthy post, so let’s get to it! Note that all the places on this list are centrally located and you can literally walk from one to another, as I did. 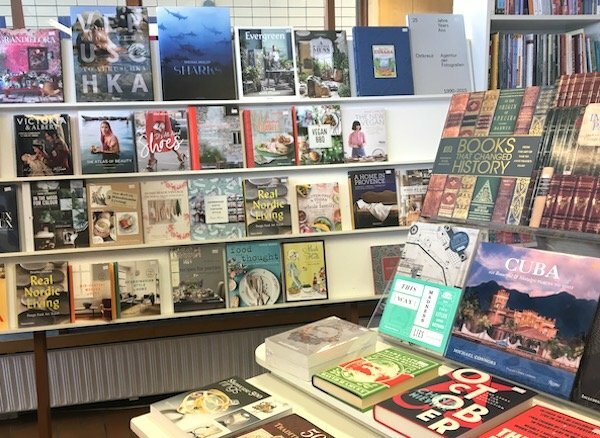 A relatively small bookstore, but an exquisitely curated one, Bókabúðin Bergstaðastræti focuses on design, culture, and food. Truly, my kind of place. The only downside is that it’s one of the few bookstores without a café, but that shouldn’t preclude a visit. The selection is unique, and most of the books are English language. Bergstaðastræti 7, 101 Reykjavík. This appealing bookstore-café-gift shop has such an unassuming exterior that even though it’s right in the center of the downtown area, I managed to ignore it until my last day in Reykjavik. About half the books are in Icelandic and half in English. 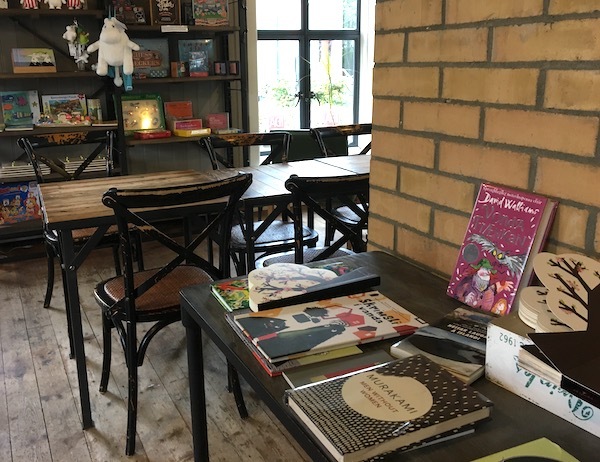 This place manages to be both expansive and cozy at the same time, including charming books and bookish gifts for children, and a nice table area to have coffee or work on one’s laptop (with coffee, of course). There’s also a menu of light fare and pastries. The photo above doesn’t nearly do it justice, nor do many of the photos online. So I guess I’ll have to return, and take some better shots! Vesturgata 2a, Grófin, 101 Reykjavík. 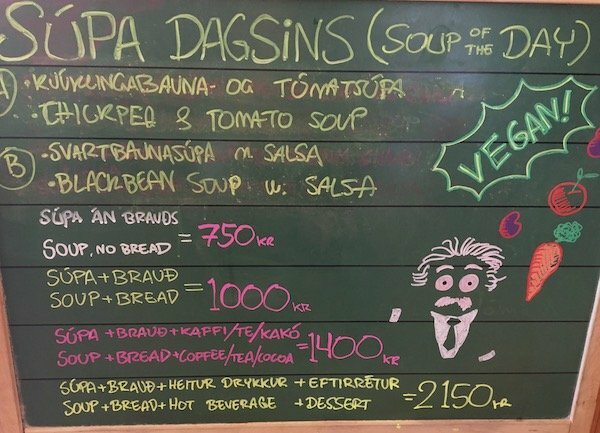 Located in the center of Laugavegur, Reykjavik’s main shopping street, Mal og Menning won a place in my heart not only for their good selection of English language books but also for their café. It specializes in vegan soup-and-sourdough bread combos for a price that’s quite economical relative to other eateries (which, you may have heard, can be quite expensive). For under $10, you can enjoy a big bowl of plant-based soup and the delicious sourdough bread that Iceland is famous for — a meal that will keep you full for hours. You can bring a book to browse through while you eat, and of course, you will carefully avoid getting any soup on it. 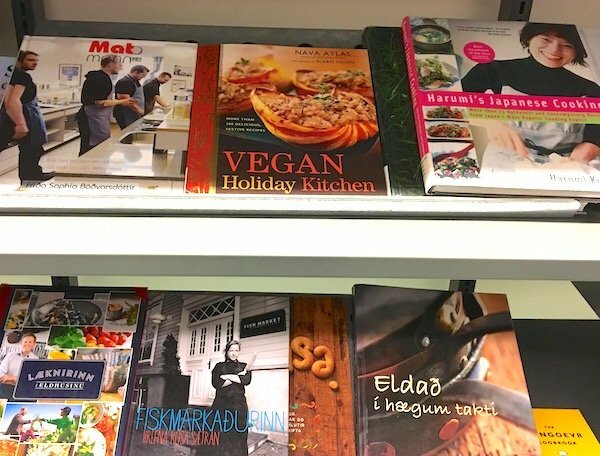 You can read more about my vegan culinary adventures in Reykjavik on my other site, The Vegan Atlas. Iceland’s largest bookstore chain (with 15 stores around the country), Penninn Eymundsson has three locations just blocks from one another in central Reykjavik. 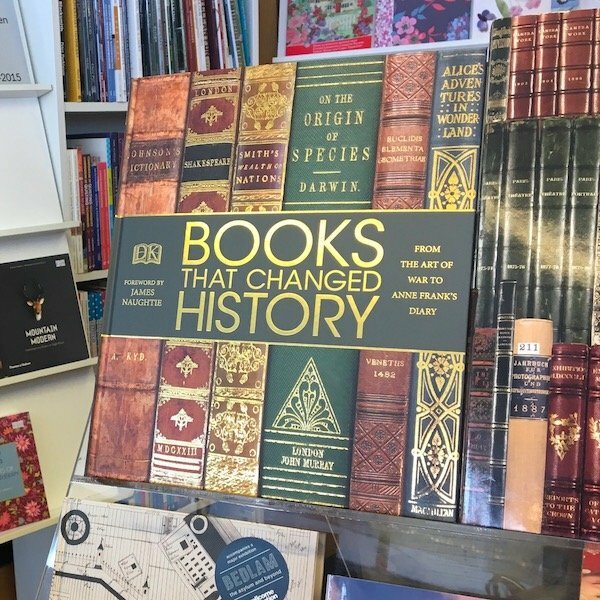 It’s also the oldest of the bookstores in the country, established in 1872. 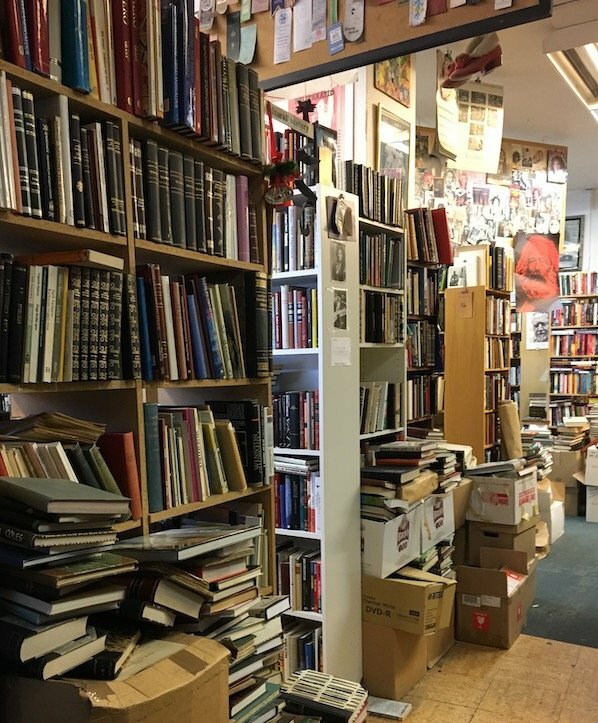 Though these bookstores may lack the visual charm of a smaller, cozier establishment, they make up for it with a great depth of offerings in both English and Icelandic. What I found interesting is that many of the English language books seem to come from British publishers, so they were a bit different from what I see at home. There were also British editions of American bestsellers, so I got to see alternative covers and descriptions. 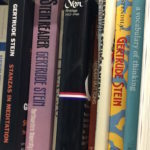 I also loved seeing all the beautifully designed books — as well as the many books on design. Within the stores are cafés run by the chain Te & Kaffi. 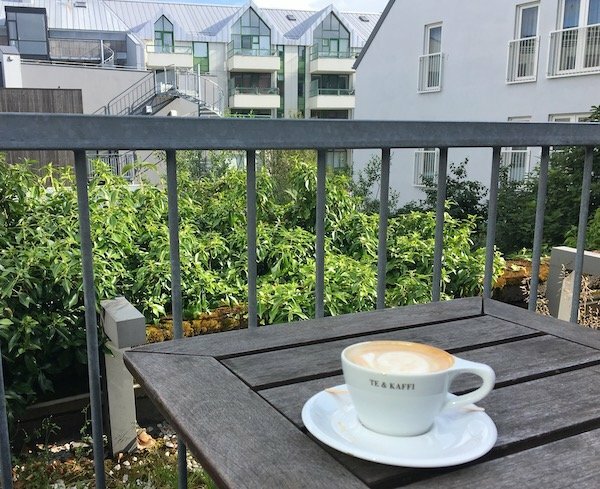 Above, you’ll see that I treated myself to an oat milk latté, a vegan brownie, and The Life-Changing Magic of Not Giving a F**k. It was a nice day and not windy (somewhat of a rarity in Iceland), so I took my break on an outdoor terrace on one of the upper floors. The bottom two photos are from the Austurstræti 18 store and the top photo is from the Skólavörðustígur 11 location. There’s also a large branch at Laugavegur 77, and all are in Reykjavik 101. 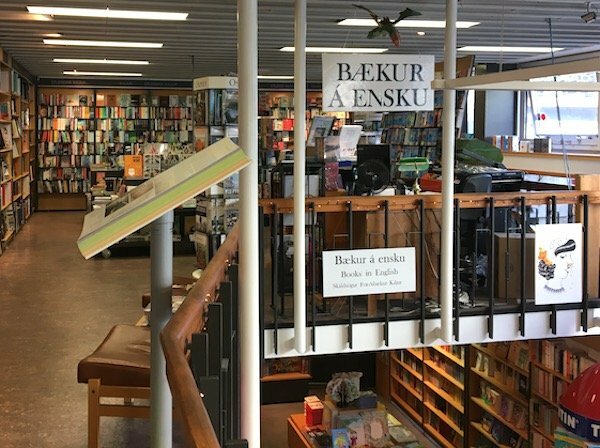 This bookstore is almost the opposite of the others on this list — it deals mostly in used books, 95% of which are in Icelandic. Piles and piles of books are everywhere, some seeming to totter almost to the ceiling. 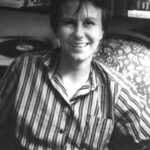 So if your interest is in poring through older books in this fascinating and challenging language, this is the place for you. Klapparstígur 25-27, 101 Reykjavik. 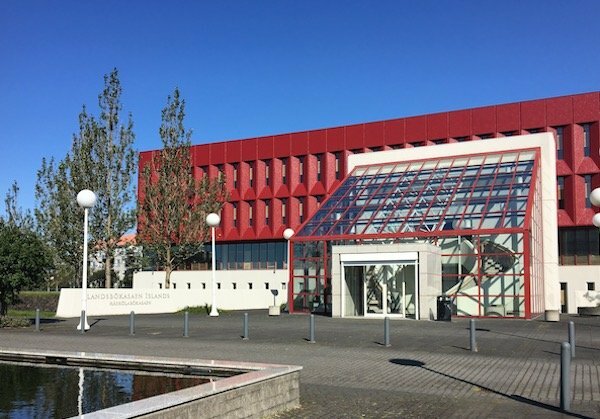 This beautiful library, just off the campus of the University of Iceland in Reykjavik, is a repository of manuscripts, archives, historical documents, and of course, books. There are also beautifully mounted exhibits, mostly about Icelandic history and culture, throughout the building. As you can see, it’s a serene setting both inside and out, and for the book-loving traveler, this just-off-the-beaten-path site is well worth visiting. Arngrímsgötu 3, 107 Reykjavík. Reykjavik’s public library has six branches around the city, with the main branch located right in the heart of the downtown area. 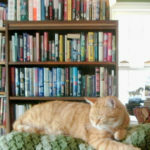 Visitors are welcome to browse, though you need a library card to be able to borrow books. 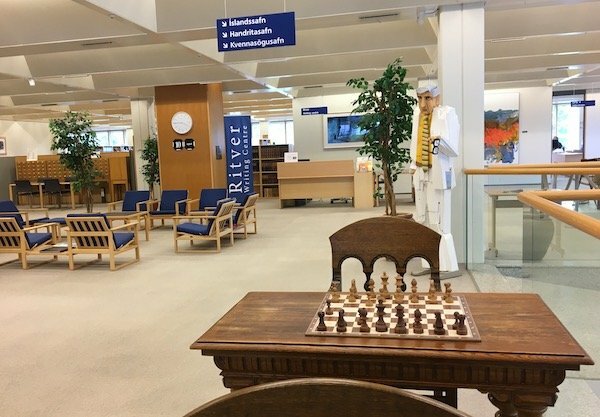 The main branch is a has several floors, all flooded with natural light, with an array of books in Icelandic, English, and other languages. One quickly expanding area is their collection of global comic books. 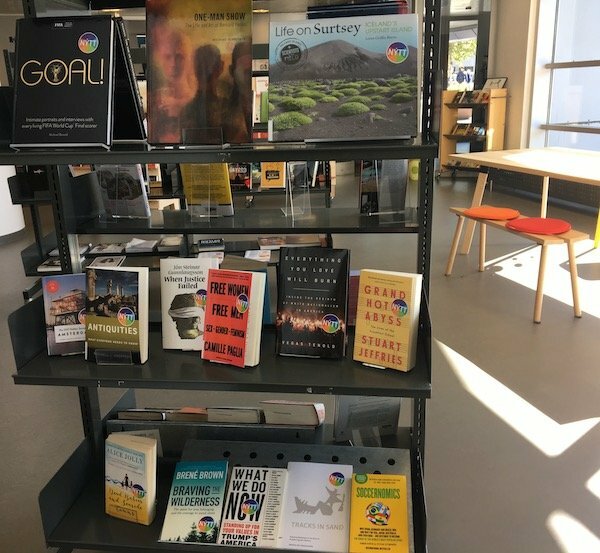 The library hosts a variety of multicultural events throughout the year. 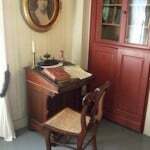 Keep an eye out for the guided literary walks that begin at the entrance during the warmer months. 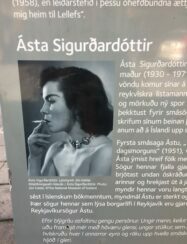 Make sure to visit the Reykjavik Museum of Photography on the top floor of the same building. It’s small, but quite impressive! Okay, I have to do a bit of a brag here. 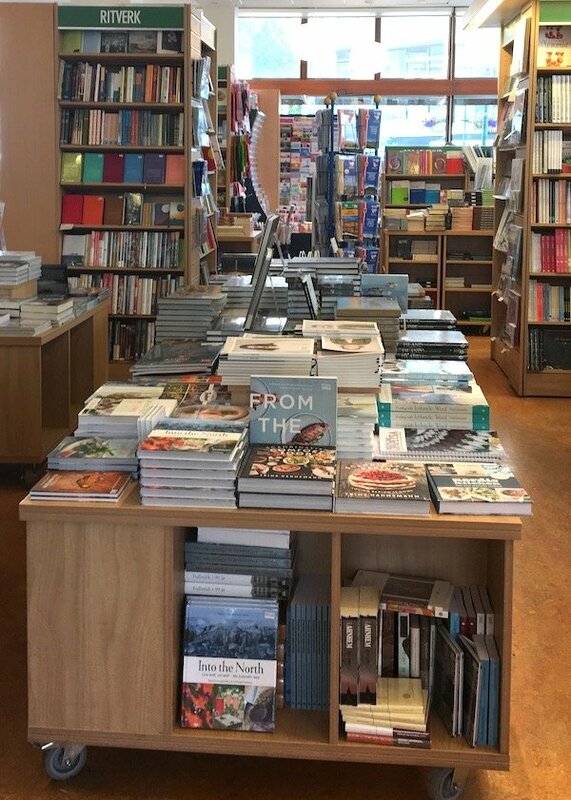 My dear friend and literary agent, Lisa Ekus, visited Reykjavik a few months before I did, and just happened to spot one of my books on display on the ground floor. When I went, it was still on display, but on one of the upper floors near the cookbooks section. 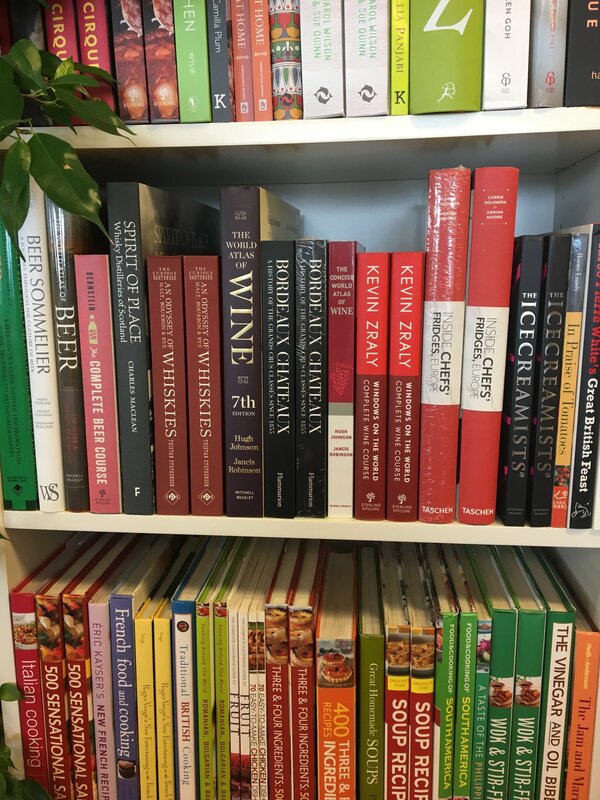 That’s my book in the center, above — Vegan Holiday Kitchen. That was a pretty cool sight to see! Tryggvagata 15, 101 Reykjavík. 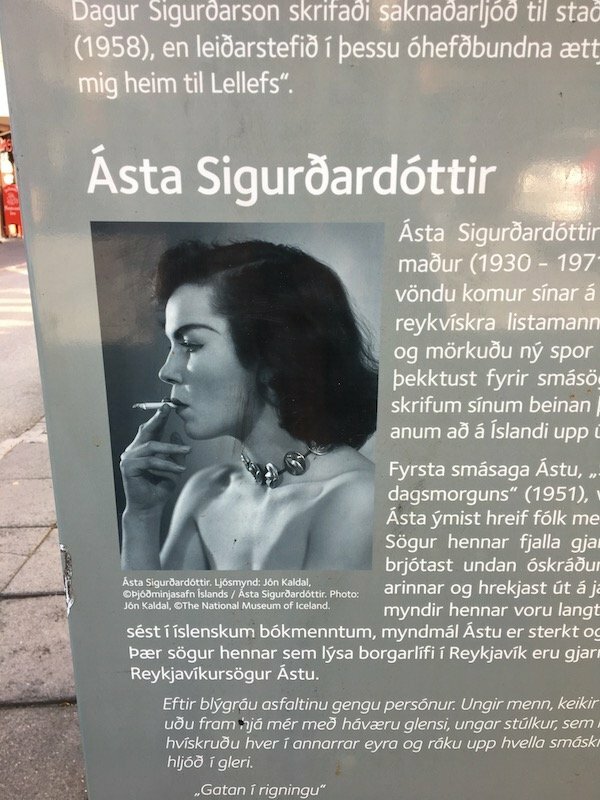 All around the city, you’ll come across signage pertaining to Icelandic Literary Figures. The signs contain a QR code which allows visitors to partake in a self-guided tour right from their smartphones. Find out more about how to download the app here. It seems like almost any cultural institution has at least a small library, or that books are an intrinsic part of exhibits (see below). 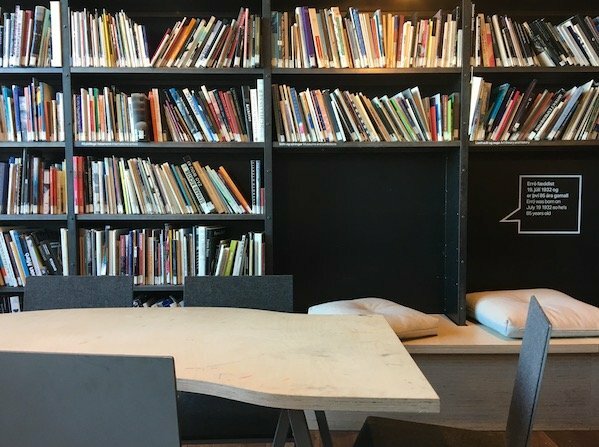 Here’s a cozy library that’s part of one of the city’s contemporary art museums. It’s packed with art books, and you can while away an hour or so if you need to take a break from touring. 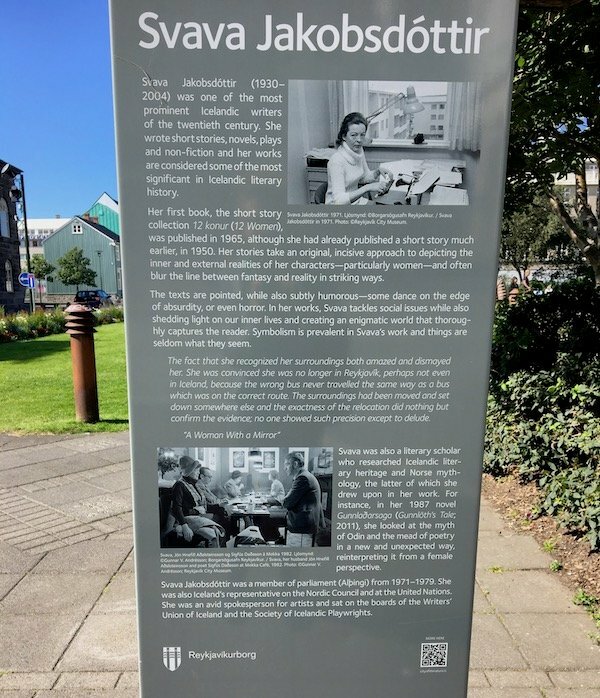 The main branch of the Reykjavik City Library (described earlier) is just a few steps away, so combining a visit to these two sites (plus the Museum of Photography on the top floor of the library building) is a relaxing and intellectually stimulating itinerary for nerds. Tryggvagata 17, 101 Reykjavík. 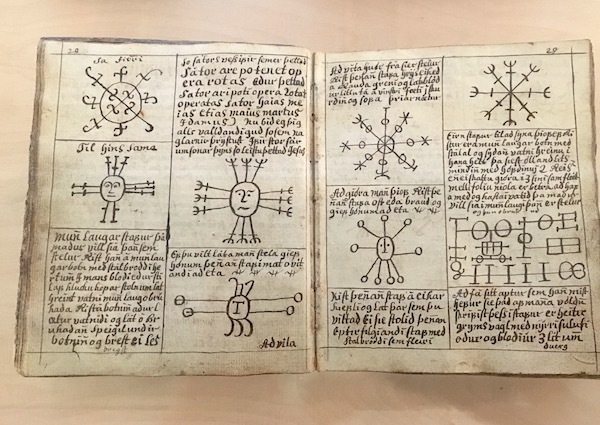 As mentioned just above, books are an intrinsic part of the country’s history and culture, with the Icelandic sagas dating back to the 9th century. 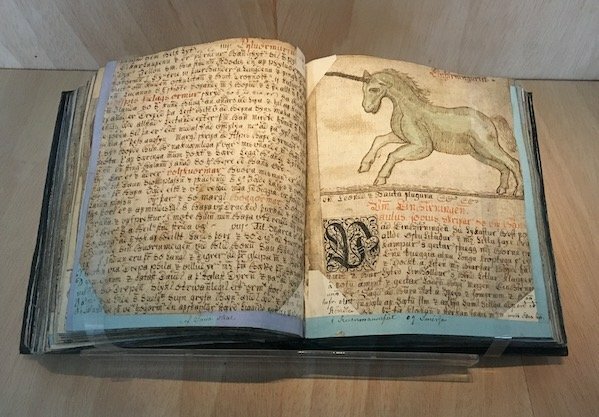 So books are often a part of most any major exhibit, no matter what the theme. Culture House hosts a permanent exhibition called Points of View – a journey through the visual world of Iceland. 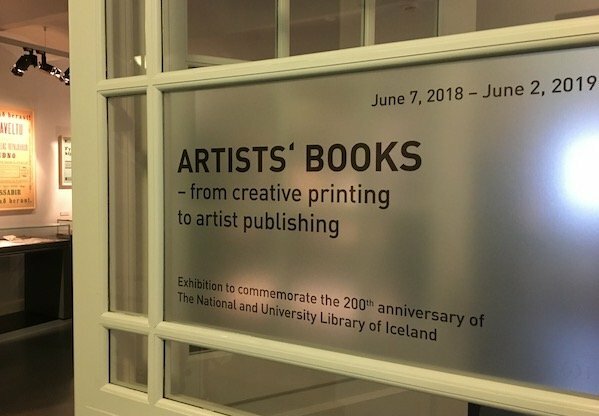 According to Culture House’s website: “The exhibition gives visitors a unique opportunity to view the collections of six major Icelandic cultural institutions. 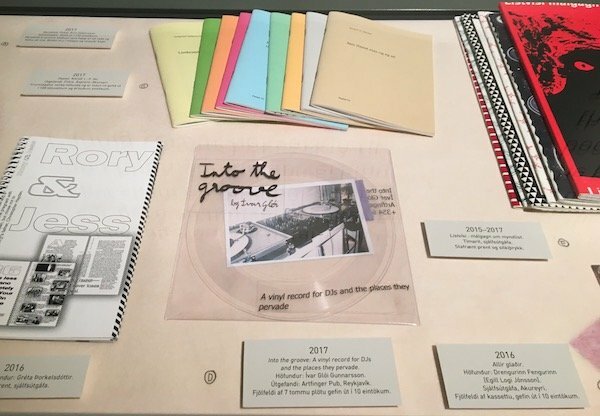 Artworks of various styles and mediums are presented thematically alongside museum objects and archival materials such as books and maps.” Above, a couple of absolutely beautiful medieval books spotted here, among many others, as well as an exhibition of contemporary artist’s books. Hverfisgata 15, 101 Reykjavík. Every other spring, Reykjavik is home to the Reykjavik International Literary Festival. From the website: “Set in cozy venues in downtown Reykjavík every two years, the festival offers interesting and entertaining programs for literature enthusiasts. Over a span of more than 30 years, the festival has welcomed Nobel-prize winners, novelists, historians, political activists, philosophers, cartoonists and more to take part in lively programs. All programs are in English and there’s no admission fee to the events.” Meet me there? 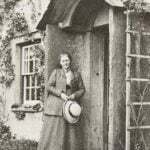 Here are more literary travels on this site. 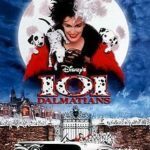 Quiz: Who Are the Women Authors Behind These 12 Classic Films?